Reading Khoi Vinh’s Passing on Periodicals made me stop, put down the Mac and pick up the latest copy of Dirt magazine. I spent most of the evening engrossed in it. One article, Jumpers for Goalposts, got me thinking. It got me thinking about fitness. It got me thinking about fun. It reminded me that the best days are the ones where you push the envelope that little bit further than usual. A couple of weeks ago I was out riding with friends in the French and Swiss Alps (the pictures are on Flickr). 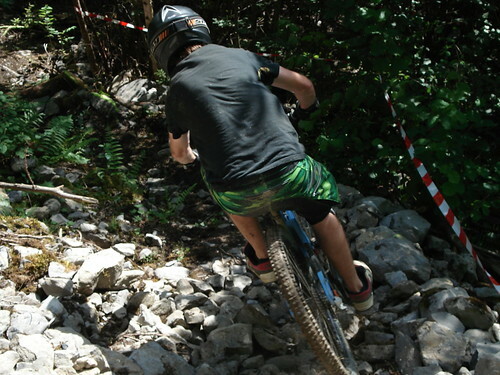 I’d just spent a day getting angry with myself and my inability to pilot my bike down the various parts of Chatel’s bike park at any sort of pace. I’m never the fastest in the group but this was just ridiculous. It was especially frustrating because just a day earlier I’d been riding out of my skin. I’d lost my self-belief somewhere. The following morning, we got up bright and early and hooked up with the long lost Nick Maher, who took us to a little known trail somewhere near Morzine (nope, not telling). The day started out much like the last. I had no confidence in the bike and more importantly, no confidence in myself. I just couldn’t do it. I was riding the whole thing at a snail’s pace already, but I got to one bit and just stalled. It’s a big, steep, diving left hander and I was just plain scared of it. The really steep stuff has always been my nemesis. I was on the verge of walking down it, but something inside me said “Nope, you’re going to do this one”. Besides, my mates were all waiting around the next corner. So I forced myself to ride it. It was slow and it was ugly, but I proved to myself I could do it. Chatting to Garry about it on the lift back up there helped. Put your weight on the outside pedal and lean the bike into the corner. Oh, and stay off the brakes as much as you can. It all sounds so very simple, but putting it into practise was pretty bloody scary. Nonetheless, it worked. A few more of the evil hairpins and it was starting to come more easily. A couple more runs and I was even beginning to flow down them. Of course, that was just one of the challenges awaiting me. I won’t even get started on the wildly off-camber corners, crazy chutes, rock gardens, drops, gnarled roots, north shore and so on. I learnt a lot that day. The sense of satisfaction I got from being able to ride it all was huge. So I bloody well rode it. It was a real challenge just getting down some of it at all. And you know what? That made it really good fun. This entry was posted on Thursday, August 16th, 2007 at 1:09 am and is filed under Bike, Friends, Holiday. 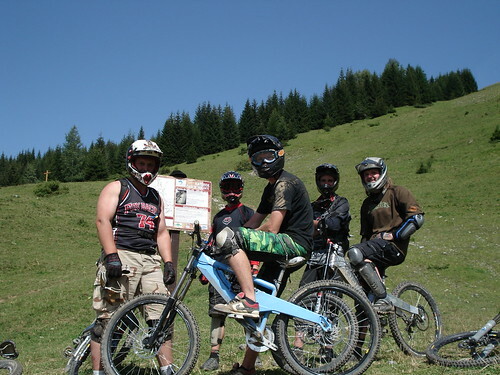 By way of consolation I went to Champery with Si and his mates and we walked a couple of sections….crying like girls. I think I would piss myself. Do you guys always wear helmets when you ride (instead of a traditional bike helmet). Gulp. Your pictures scared me. Stop writing so much. I can barely keep up.